Plot: A heating oil company owner finds himself in a turf war and a battle with the authorities in 1981 New York City. Jessica Chastain gives an outstanding, award-worthy performance in this otherwise lackluster film. 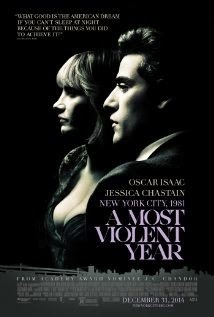 With a title like A MOST VIOLENT YEAR you'd think there would be a good bit of violence. Well, you'd be wrong. Most of the violence takes place off camera and even then it's pretty tame. My main thought as I walked out of the theater was, "Who knew the heating oil business was so rough?" I wish I had been thinking, "Wow, what an incredible movie." The film is slow, tame and the ending is exceptionally anti-climactic. I would say it's a two-hour waste of your time, but that would be unfair to Chastain's performance. She makes the film tolerable.